Park University men's volleyball earned an at-large bid for the inaugural 2019 NAIA Men's Volleyball National Tournament this week at Grand View University in Des Moines, Iowa. The fifth-seeded Pirates (20-4), who open national tourney pool play Tuesday against fourth-seeded Grand View (18-1), are one of eight teams in the tournament. PARKVILLE, Mo. 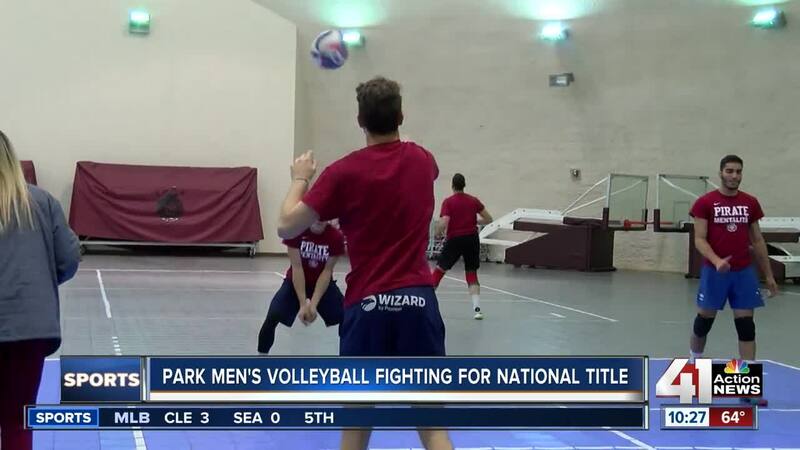 — Park University men's volleyball earned an at-large bid for the inaugural 2019 NAIA Men's Volleyball National Tournament this week at Grand View University in Des Moines, Iowa. The fifth-seeded Pirates (20-4), who open national tourney pool play Tuesday against fourth-seeded Grand View (18-1), are one of eight teams in the tournament. Missouri Baptist (26-0) from St. Louis, the top overall seed, and No. 8 seed Saint Xavier (20-7) from Illinois also are in Park's pool. The top two teams from pool play advance to the NAIA semifinals on Friday with the title game set for Saturday. This isn't the first brush with greatness for Park men's volleyball, which previously won five NAIA national invitational tournament titles in 2003, 2008, 2012, 2014 and 2017. "When you're part of Park University and when you're a Pirate, you always wanna get the ring," senior outside hitter Andrea Maggio said. "You always want to get to nationals and win it all. It's part of the culture here. It's part of being a Pirate." Park coach Mike Talamantes, who also coaches the Pirates women, is in his eighth year with the program. In addition to his five national men's title, Talamantes led the women's team to a title in 2018. But he knows past success doesn't guarantee any future success. "It's always a different team; it's always a different challenge," Talamantes said. "The format this year for the tournament is different. The style of the tournament is different, so everything is a new challenge for us." After missing the national invitational tourney last spring, the 2019 Pirates have a chip on their shoulders. The players on the team are playing with a chip on their shoulders after not qualifying for nationals last year. "It's been a two-year process," sophomore outside hitter Felipe Santos said. "We've been through a lot these two years. so now we think we are actually ready for this, to compete for the national title." Talamantes appreciates the mettle this group showed. "My first six seasons, we had always made the national tournament ...," he said. "No (Park) team had to come back from a disappointing year, so I think when we talked to this group this year. You have a chance to do something special." It could be very special by week's end. "To be 20-4 and be back in the national tournament, No. 5 in the country, I am really proud of the way they've progressed to this point," Talamantes said. "And we've got some tricks ready for (Tuesday), so we've enjoyed our week of practice. We'll be ready."